NEUROSIS has just announced the band’s plans to celebrate three full decades together with their fans on two continents in early 2016, including shows in their native Bay Area and at Roadburn Festival in The Netherlands. Additionally, the band will release deluxe vinyl reissues of two of their most revered and long out-of-print titles; Through Silver In Blood and Times Of Grace. As the band passes the thirty-year mark this Winter, NEUROSIS will celebrate this milestone with two stateside performances on March 4th and 5th at the Regency Ballroom, and then two more sets on April 16th and 17th headlining the massive Roadburn. At these four very special performances, the band will deliver material spanning their entire recorded lineage, from 1987’s Pain Of Mind through 2012’s Honor Found In Decay, with varied set lists at each event. 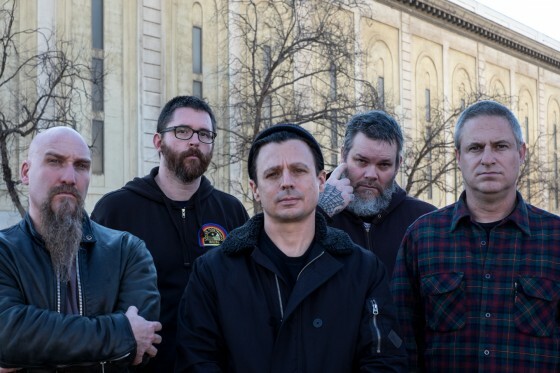 These sets will span the band's entire career, showcasing NEUROSIS’ comprehensive evolution from their primitive beginnings to the seminal, epic outfit they are today, as the band’s ever evolving, sonic palette has become a template for underground music over the last three decades, and resist genre classification. Additionally, NEUROSIS will have two of their most revered and long out-of-print titles reissued on super deluxe 180-gram double vinyl this Fall. Through Silver in Blood (1996), which Fact Magazine recently deemed the #1 best post-metal album of all time, has not been printed on vinyl in ten years, while Times Of Grace (1999) is seeing its first pressing in over fifteen years. Additionally, Grace, the 1999 TRIBES OF NEUROT companion piece to Times Of Grace, will also see a deluxe reissue, its first time ever on vinyl. Each reissue will contain reinterpretations of the original iconic artwork, will be housed in heavy duty “tip-on” jackets, and will be available in a variety of limited edition exclusive colors. The reissues are set for worldwide release on September 4th and will also include full album digital download codes. Preorders for the reissues are now available directly through Neurosis’ own Neurot Recordings at THIS LOCATION. NEUROSIS is currently on tour in North America, embarked on their most massive North American tour since before the turn of the millennium. Having begun on July 31st, the band crosses into Canada today for two shows — Toronto this evening, and the massive Montréal Festival where they’ll join the likes of Mastodon, Meshuggah, Gorguts and many others on Friday — followed by shows in Boston, New York City, Philadelphia, Richmond, Carrboro, Atlanta and New Orleans before coming to a smoldering finale in Houston on August 16th. 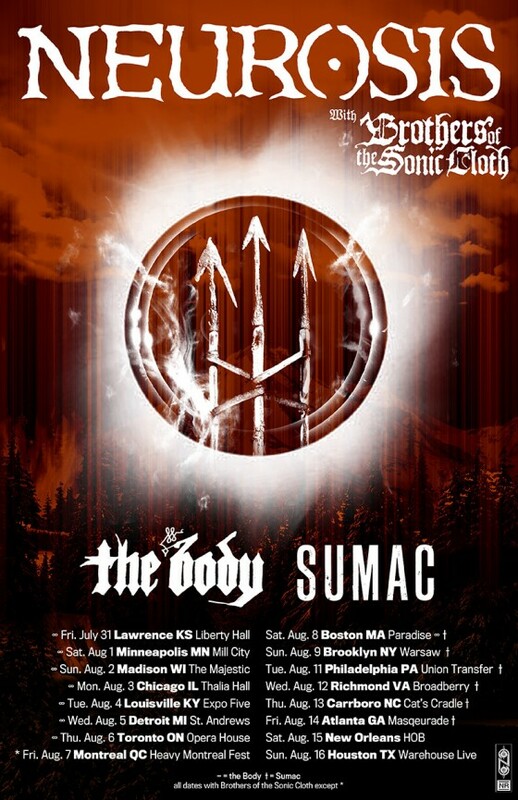 The band is playing in cities and states which they have not visited since the 1990s during the trek, which sees NEUROSIS supported by labelmates Brothers Of The Sonic Cloth (featuring Tad Doyle of TAD and Hog Molly) for the entire trek, with additional legs of the tour also featuring The Body, Sumac, Pinkish Black and labelmates Iron Tongue.